This walk: 2015-7-22. Hut circles, sundew, bog asphodel, cross-leaved heath/bog heather, bell heather, common heather/ling, wedge and groove method, feather and tare method, Castle Drogo, Shapley Tor, Hookney Tor, mining reservoir, West Coombe Farm, haymeadows, Leapra Cross, pyramid orchid. Previous walk in this area: 23rd September 2009 and 16th January 2013. Massive hut circle, at SX 69771 83130. Another view of the hut circle . 2nd hut circle at SX 69760 83061. A 3rd hut circle with the other two behind. Common heather or Ling, Calluna vulgaris. More information on Dartmoor CAM's Heather & Ling page. Clump of Bell heather . The left (far) end has been split by feather and tare, the nearer end (right half of the photo) has been split by the wedge and groove method. Feather and tare came into use about 1800. 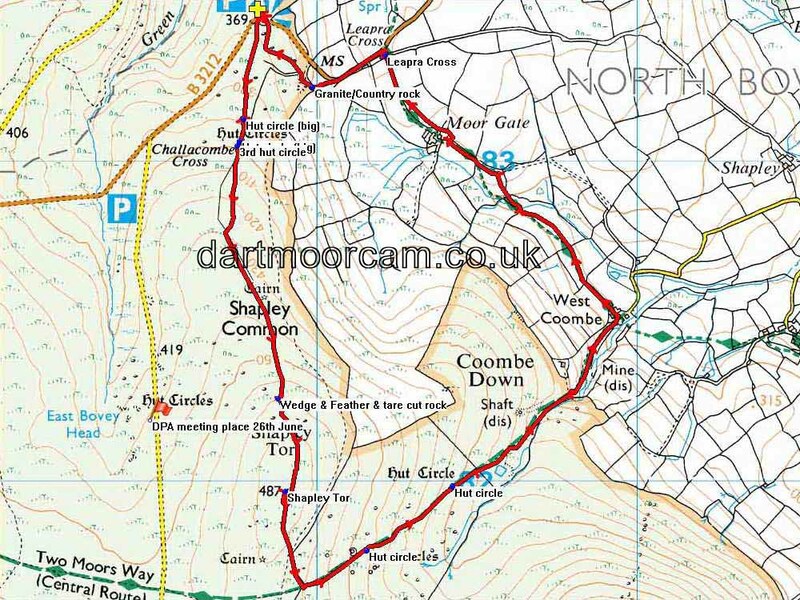 Moere information on Dartmoor CAM's Splitting Granite page. Zoomed view to Castle Drogo - still under wraps! Shapley Tor, SX 699 821, elevation 480 metres (1574 feet) - from a kneeling position, its that impressive - see the grass heads at the right!. Hookney Tor (right), SX 698 812, elevation 497 metres (1630 feet). with a large cairn to the left. Zoomed view, strange effect, possibly due to the rain. In view of the bracken, it was best to do what the notice says! King Tor beyond, at SX 708 813. Formerly the house of the mine captain of East Vitifer Mine. West Coombe Farm, this barn (left) was added over the pre-existing track and, it is reputed that, the Mariners Way then ran through the barn. It may have been that sailors could spend the night here before continuing their journey - a sort of primitive bed and breakfast, or maybe "barn and breakfast"? Along The Mariner's Way, part of the Two Moors Way (being Dartmoor and Exmoor). Today's stalwarts, in a field after West Coombe Farm. Slotted gatepost, origin of the 5-bar gate, this has 5 holes to receive five wooden bars. The path is on the Two Moors Way (Eastern Route), also known as the Mariners Way, by which sailors dropped off on one Devon coast would join a ship, or look for one, on the other Devon coast, commonly Bideford - Dartmouth, a distance of 70 miles. Busy in the 1500s (Tudor times) with wool and tobacco trading and ship-building in Bideford . Holes made by geese,. nibbled around the edge? Bracken, possibly managed for Fritillary butterflies. From its proportions, it is estimated that the cross would have stood over six feet in height: each face has a raised Latin cross (i.e. in relief), which is unusual on Dartmoor (not easily discernible in some lights). © Crown copyright and database rights 2015. Ordnance Survey, Licence number 100047373. Use of this data is subject to terms and conditions. Also, Copyright © 2005, Memory-Map Europe, with permission. This walk was reached by driving north-east from Postbridge, past the Warren House Inn, and finding the car park after 3.5 km, on the left. It is marked by a truncated P symbol and a yellow cross on the map. Distance - 5.38 km / 3.34 miles.